(The Japan Times, etc. on Aug 21, 2016） NISHINOMIYA, HYOGO PREF. 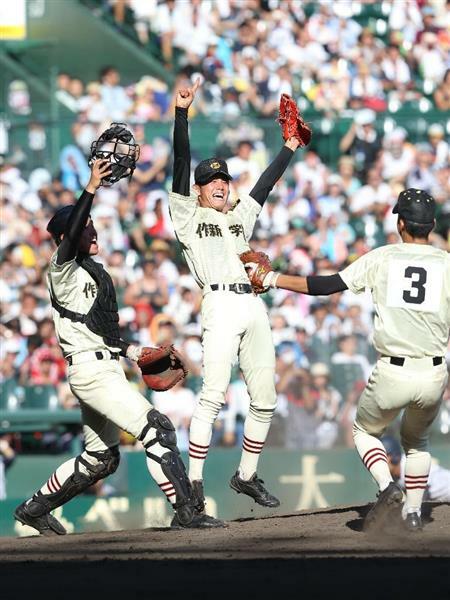 – Sakushin Gakuin High School romped past Hokkaido’s Hokkai High School 7-1 to win Japan’s prestigious National High School Baseball Tournament on Sunday afternoon. Playing before a packed crowd at historic Koshien Stadium, Sakushin ace Tatsuya Imai allowed one run, while striking out nine over the distance to complete his fourth game of the tournament. The championship was Sakushin’s second. In 1962, the Tochigi Prefecture powerhouse became the first in history to capture both Koshien tournaments, the spring invitational and the summer national championship. Hokkai, representing southern Hokkaido, was seeking its first championship after reaching the finals at Koshien for the 37th time. Working with a 1-0 lead, pitcher Kento Onishi, whose four complete-game victories since Aug. 12 had gotten Hokkai into the final, allowed five runs in the fourth without retiring a batter. (By BFJ) After the completion of the 98th National High School Baseball Championship, the 18-player roster for the 2016 XI BFA U-18 Championship was named on August 21, 2016. Led by manager Mamoru Koeda, the team will take part in the training from August 23 and an exhibition game against the Japanese College National Team at QVC Marine Stadium in Chiba on August 27 before participating in the 16 XI BFA U-18 Championship in Taichung, Taiwan from August 30 to September 4. Majority of the18-member was selected from the players of the summer “Koshien”, including thethe champion pitcher (Sakushin Gakuen) and three other aces: Terashima (Riseisha), Fujihiro (Yokohama), Takahashi (Hanasaki Tokuharu).